This is the third edition of a standard textbook in Religion and Science - which is already a classic! 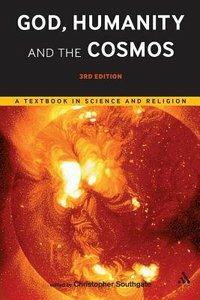 "God, Humanity and the Cosmos", first published 1999, revised and expanded edition 2005, remains the only full-length textbook of the science-religion debate. It is divided in five 'books'. The first covers overarching issues in the history of the science-religion interaction, the theology of creation and the philosophy of science. The second looks in depth at the three most prominent areas of interaction - physics, evolutionary biology, and psychology. The third looks at contemporary theological resources for engaging with the science-religion interaction, both within and outside the Christian tradition, and at God's action in the world as a test-case for scientifically-informed theology. The final book considers areas of particular topical concern - how science and religion interact in secondary education, what issues are raised by 'the new atheists', what particular issues are raised by science for Islamic thinking, what challenges are thrown up by the human use of technology, and specifically by climate change. The final, brief 'book' consists of a short set of predictions about the future development of the field. About "God, Humanity and the Cosmos (3rd Edition)"
Christopher Southgate is a Research Fellow of the University of Exeter, U.K., and Dean of Studies of the South West Ministry Training Course. 1. An Introduction To The Debate Between Science And Religion; 2. The Significance Of The Theology Of Creation; 3. Within Christian Tradition: Systematic Considerations; 4. Truth And Reason In Science And Theology; 5. Theology And The New Physics; 6. Theology And Evolutionary Biology; 7. Psychology And Theology; 8. Models Of God In An Ecological Age; 9. Some Resources For Theological Thinking On God And The World From Outside The Christian Tradition; 10. A Test Case - Divine Action; 11. Science And Education; 12. The New Atheism; 13. Islam And Science; 14. Technology And Christianity; 15. Biotechnology - A New Challenge To Theology And Ethics; 16. Climate Change - The Challenge To The Human Project In The 21st Century; 17. A Look To The Future; Appendix: A Note For Teachers; References And Bibliography; Index.